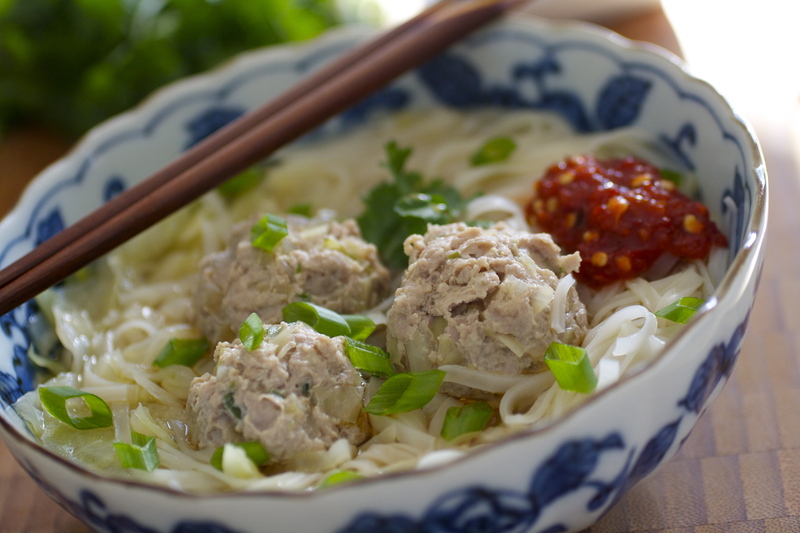 This Asian Meatball Noodle Soup is a healthy and quick weekday dinner. 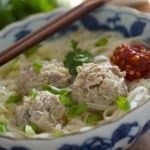 Pork meatballs simmered in chicken broth with cabbage and topped with rice noodles, chili garlic hot sauce, and fresh cilantro. 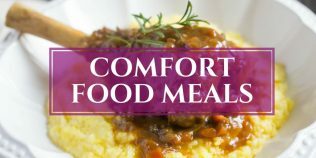 A deliciously easy and comforting soup! Once the cold weather creeps in, I start making soups. Soups are one of the greatest inventions of all time. 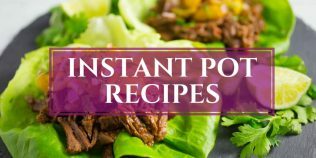 because it can be made in one pot. One pot meals are pure genius. I especially love a one pot Asian noodle soup. With flavors are so clean and fresh, this chicken soup is really comforting on a cold, winter’s day. 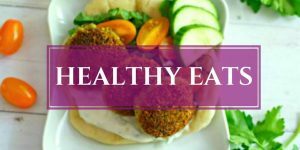 Super loaded with protein and healthy vegetables, it’s an ideal addition to a healthy meal plan. This recipe is my version of the Chinese Lion’s Head soup, but with a little extra somethin’, somethin’ (aka noodles). I mix chopped cabbage in the meatballs, make them into smaller balls, and cook them directly in the broth. 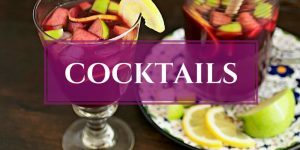 Any type of Chinese cabbage (napa or bok choy) or a green cabbage can be used here. Typically I use napa or bok choy in this recipe, but only had green cabbage on hand so I used it for both the meatballs and the soup. Feel free to add whatever veggies you want to the broth while the meatballs are cooking. Thinly sliced or chopped carrots, red bell peppers, spinach, kale, and broccoli would all be great additions to this chicken noodle soup. Use whatever is in season and in the refrigerator. 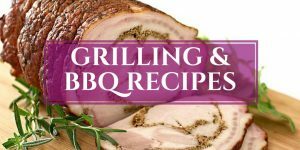 If you don’t eat pork, change it to ground chicken or turkey. Leave out the noddles if you want a low carb option. Go crazy and make it your own. I promise, I won’t be offended. My ginger always goes bad before I can use it up, so I freeze it to keep it fresh. All you do is put a whole piece of unpeeled ginger in a freezer proof bag or in freezer proof plastic wrap. and when finished, wrap it up and put it back in the freezer. No need to thaw or peel the ginger before grating. I’ve kept fresh ginger in the freezer for up to 6 months with no problems. 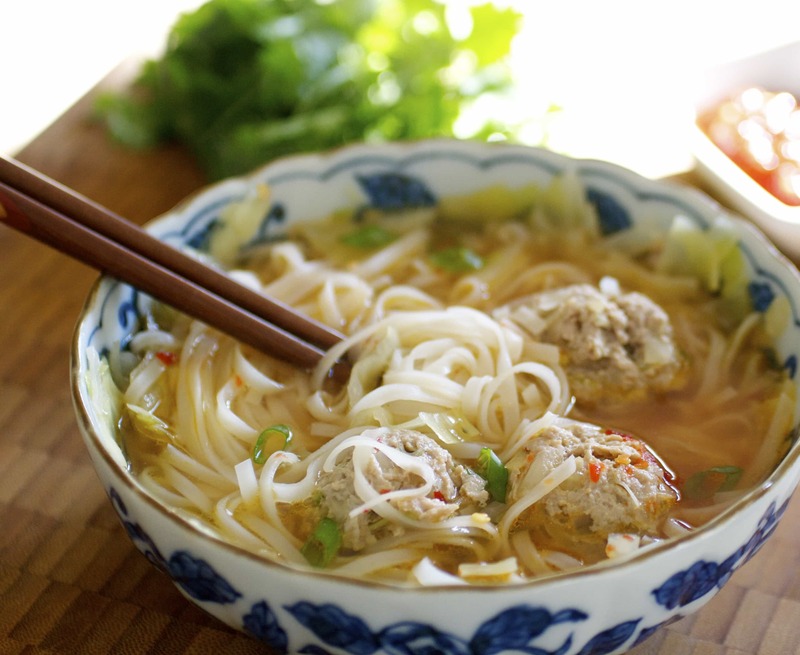 So brave the cold winter by making some comforting Asian Meatball Noodle Soup and keep warm! Please let me know in the comments how you like the soup and what different vegetables you used. 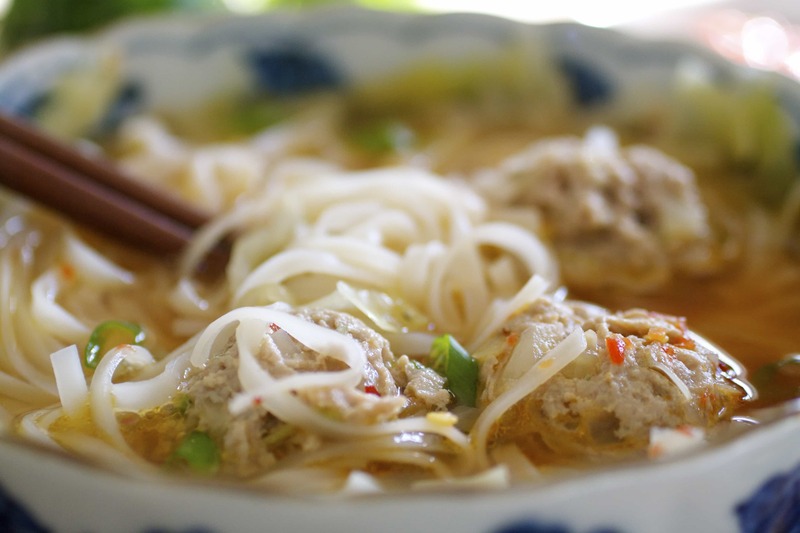 Pork meatballs simmer in chicken broth with cabbage, topped with delicious rice noodles, chili garlic hot sauce, and fresh cilantro for a deliciously healthy and easy soup. 8 oz rice noddles , cooked according to package directions and rinsed well. In a large bowl, combine all of the meatball ingredients and mix until well combined (I use my hands). Cover and place mixture in refrigerator for at least 30 minutes. In a large pot, bring broth to a simmer over medium heat. Reduce heat to low. 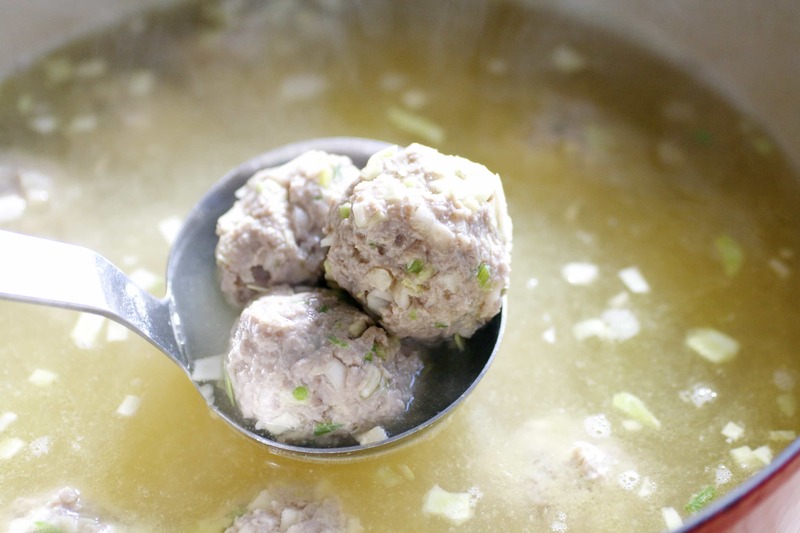 Form meatballs into balls (about golf ball size) by hand and drop them into the hot broth. Cook for 3-4 minutes, then gently stir in the cabbage. Cook for another 10-15 minutes, or until the meatballs and cabbage are fully cooked. Gently stir the Nama Shoyu, or soy sauce, into the broth. Keep warm until ready to serve. 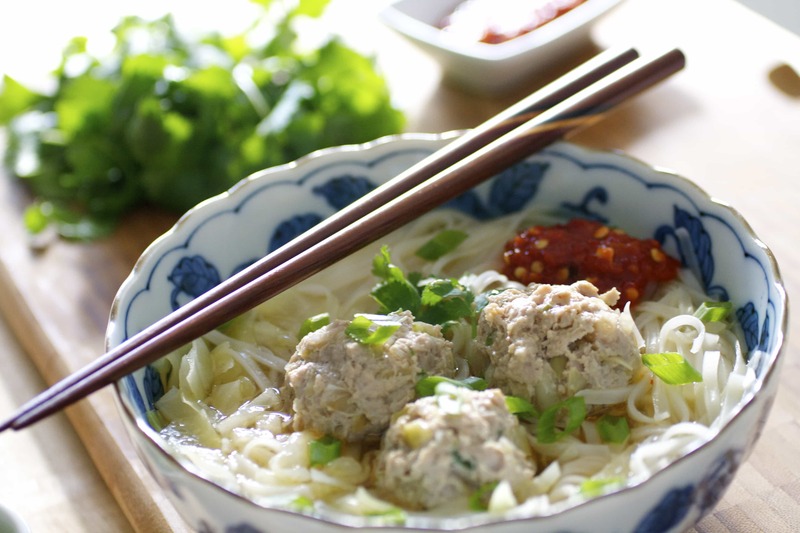 When ready to serve, place desired amount of cooked noodles in a bowl and ladle the broth and meatballs over them. Drizzle a small amount of sesame oil on top. 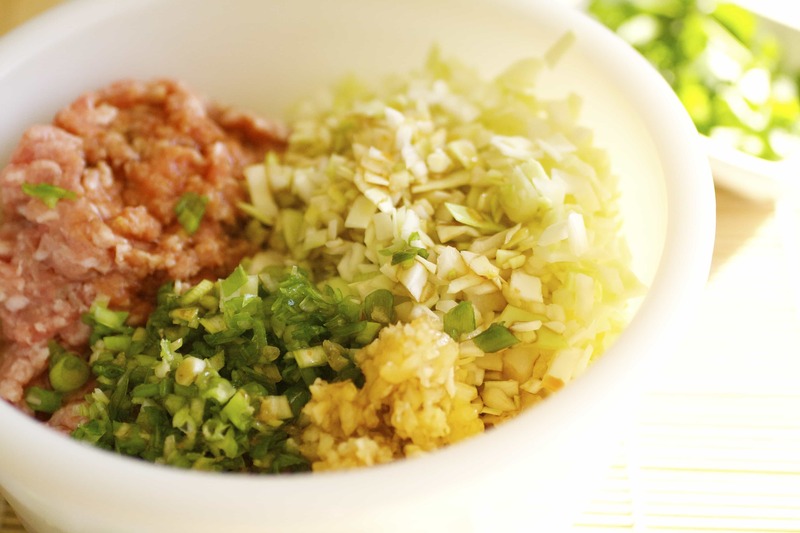 optional: top with cilantro and add garlic chili sauce to taste. This sounds perfect right about now! Great photos by the way! Thanks so much Cheyanne! BTW, love your blog. 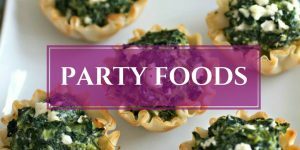 Fantastic recipes and beautiful photography. This was yummy!! I didn’t have exactly the same veggies but, more importantly, the meatballs were just what I was expecting! Tasted so good, and just like going out to an Asian soup spot. I had pea pods, bok choy, mushrooms, sheddred carrots, cabbage and broccoli for the veggies. And of course the rice noodles, what a lovely light soup, and healthy!! Thank you!!! 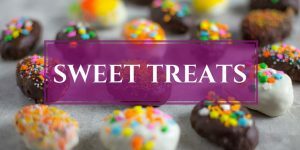 You made my day Jeanne and thank you so much for taking the time to review the recipe! Super happy you liked it and LOVE all the veggies you added.Trying the pea pods and mushrooms in mine next time I make it!